Adding cheese to a salad is what takes it from boring to delicious. What’s even better is that because cheese is such a diverse food group, you can find a flavor for almost any salad that you choose to nom on. For example, a taco salad will usually be topped in cheddar or jack cheese which is more savory, a greek salad will be topped with feta which is quite robust, and a strawberry salad may be sprinkled with goat cheese which has a sweeter essence. We live in a wonderful world where there’s a cheese for everything; take advantage of it! Ahh, what’s better than the combination of cool, crisp lettuce and marinated steak? Nothing, my friend other than lettuce combined with chicken or salmon. With these types of salads, a successful execution is based on the maker’s ability to mix something as watery as lettuce with something as flavorful as most meats. Like cheese, you can do a lot of creative things with meat on salads. Something we love is the classic Cobb salad, which mixes grilled chicken with the flavors in the blue cheese—it’s something that’s hard not to love. Wait, I thought we were talking about how we could make salads delicious, right? Hear us out. The secret ingredient to a yummy and savory salad is not the meats and cheeses, but rather the choice of fruits and veggies. The base of a salad is some sort of leaf, whether it be spinach, lettuce, or something similar. That being said, a salad with a jenky base isn’t going to taste great. Additionally, it might be surprising, but vegetables can be super yummy, especially on a salad… as long as it’s also mixed with cheese (duh!). Yikes, a salad without any sort of dressing seems kind of, well, gross. It’s this liquid goodness that truly ties together the flavors in the veg, cheese, and meats. What’s quite neat is that there are dozens of dressings to choose from that are oh-so-different. Regardless of the make up of the salad, there is a dressing that will work for it. Personally, we’re a fan of the classic ranch, but that’s just it. Some people enjoy Caeser, others prefer italian, and some even opt for olive oil and vinegar. 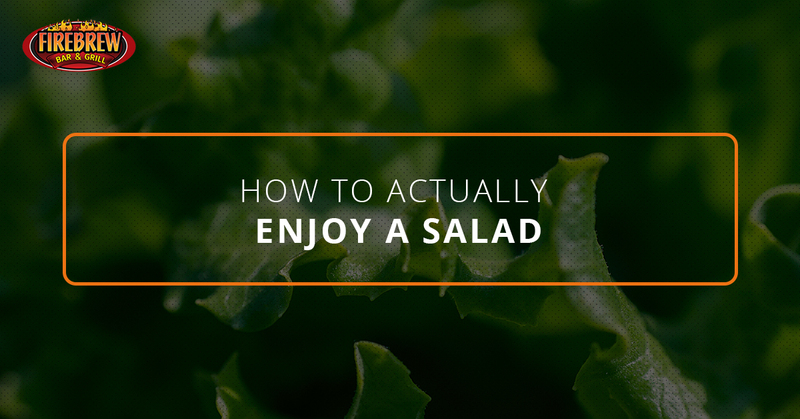 Regardless of your taste preferences and lifestyle choices, a salad out there exists for you. Between the large variety of cheeses, vegetables, meats, and dressings, you’ll be sure to find something that satisfies your cravings. Salads don’t always have to be healthy and bland, and we’re here to help dispel that stereotype. Anyway, for a large selection of some of the most delicious dishes on the east coast including burgers, pizza, seafood, steak, AND salad, our Virginia Beach restaurant is here for you. Check out our menu and come in today!